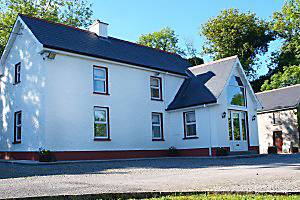 The Lodge is a beautifully restored two storey 4-star Irish Tourist Board approved house set in a peaceful rural setting only a five minute drive from Ballinamore town. This house is situated right beside George’s Lake, surrounded by a working farm and within 100 meters of Lake View House. From the doorstep of the Lodge one can walk down to a private mooring and take out one of the complimentary boats for some fishing, or just a morning row. The property can accommodate up to six people and consists of three bedrooms, one double en-suite and two twin rooms with a shared bathroom. Downstairs there is a lounge with an open fire and multi-channel TV. The Kitchen/Dining room is equipped with all mod cons including dishwasher, microwave, toaster and deep fat fryer. There is an additional downstairs toilet and reception area with telephone. Adjacent to the “Lodge” is the Granary with washroom, storage room/drying room for your fishing gear, Bait fridges for the fisherman and a separate bathroom. 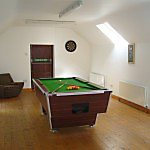 There is also a games room upstairs with pool table and dartboard for your leisure. 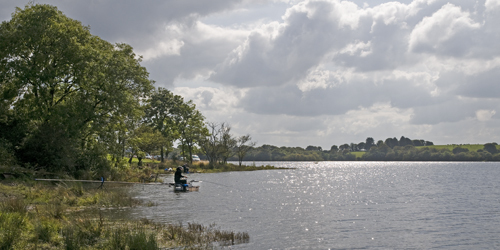 A bonus is private on-site access by boat to George’s Lake where you can expect tench, bream, roach, hybrids and a few decent pike.